Boats gather on the waters of Grand Lake on a 2018 summer day. Large crowds are expected during the upcoming Labor Day weekend. 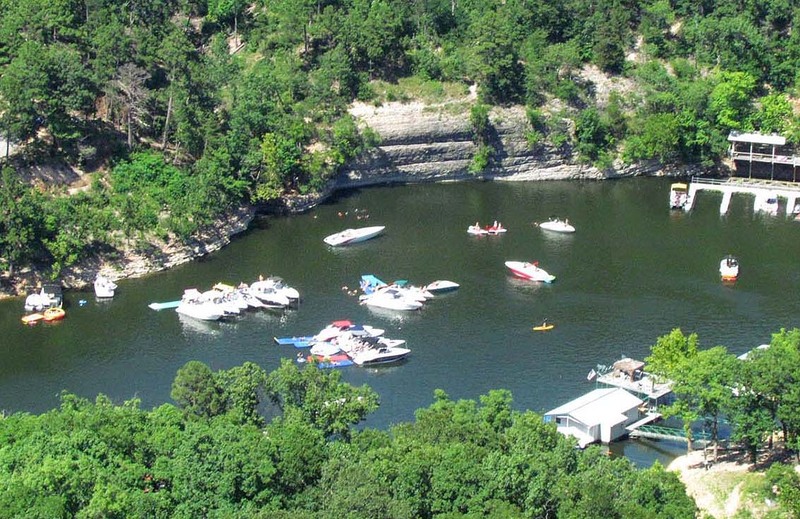 If you are headed to Grand Lake, Lake Hudson or the Illinois River, GRDA reminds you to boat safe, smart and sober. Heading to the lake or the river for the long Labor Day weekend? If so, the Grand River Dam Authority Police Department wants to remind you of some important information that can help promote a safe time on the water. Whether you are visiting GRDA’s Grand Lake, Lake Hudson or the scenic Illinois River, it is important to remember that enjoyable outings always start with boating (and floating) safe, smart and sober. DO wear a life jacket. They float, you don’t. However, they only work if you wear them. Remember, if you are floating the river, children 13 years of age and under are required to wear a life jacket at all times. On the lake, children 12 years of age and younger are required to wear a life jacket on vessels under 26 feet long. However, we encourage everyone to wear a life jacket at all times. DON’T DRINK AND BOAT. Alcohol use continues to be the single leading factor contributing to boating accidents. Don’t ride tired: PWC operation requires a real sense of balance. Tired operators do not have as much balance, which means less controlled operation. Watch the weight: Don’t carry more passengers or weight than is recommended in your PWC’s owner manual. The heavier the load, the harder it is to handle and turn your PWC. Watch out for others: Because lake traffic changes constantly, riders have to be very aware of their surroundings at all times. Know what the craft is capable of: Just because you have ridden a PWC before, don’t assume they are all the same. For the most part, they are very similar, but riders must be educated about the specifics of the craft they are operating. Know where you are: It is very important to know your location on the water. Are you near hazards such as rocks, buoys or sandbars? Are you in a place that is popular with skiers? Even though PWCs are designed to operate in shallow waters, it is important to remember that shallow water can become no water in a hurry. Avoid such areas. Never drink and ride: PWC operation requires clear thinking, quick decisions, the ability to focus, depth perception, ability to judge speed and distance and ability to track moving objects. Alcohol impairs all these abilities while also affecting balance. Oftentimes, PWC injuries occur when people fall into the water and are too inebriated to climb back on board. Watch your speed: Many PWC accidents are a result of excessive speed. PWC operators must match their speed to their skills. Don’t be overmatched by traveling too fast. For more information about the GRDA Police Department or how an officer can assist you, contact the department at (918) 256-0911. Finally, if you need assistance from your boat, the GRDA Police Department encourages you to call 911. If you do not have a cell phone available, you can radio the GRDA Police on Marine Band 16. Whether you are coming to the lake, to the river, to the dam or maybe to all three, GRDA encourages you to keep these tips in mind as you enjoy the Labor Day weekend.